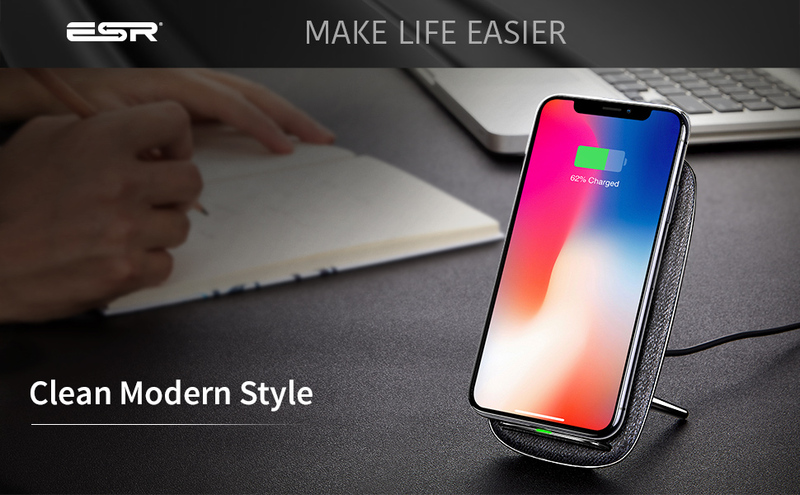 Work with iPhone XS Max, iPhone XS/X, iPhone XR, iPhone 8 Plus/8; Samsung Galaxy Note9/Note 8, Galaxy S10+/S10/S10e/S9+/S9/S8+/S8 and any devices compatible with Qi Wireless Charging. Stylish, Textured Fabric Charging Stand: The premium fabric design not only feels good to the touch but adds a clean, modern look to your home or office. Upgraded Fast Charging: This upgraded design is specifically made to dissipate heat quickly for a faster, safer, more stable charging experience. Versatile Viewing Experience: A dual-coil design, lets you charge your phone vertically or horizontally while using it for things like FaceTime or watching videos. 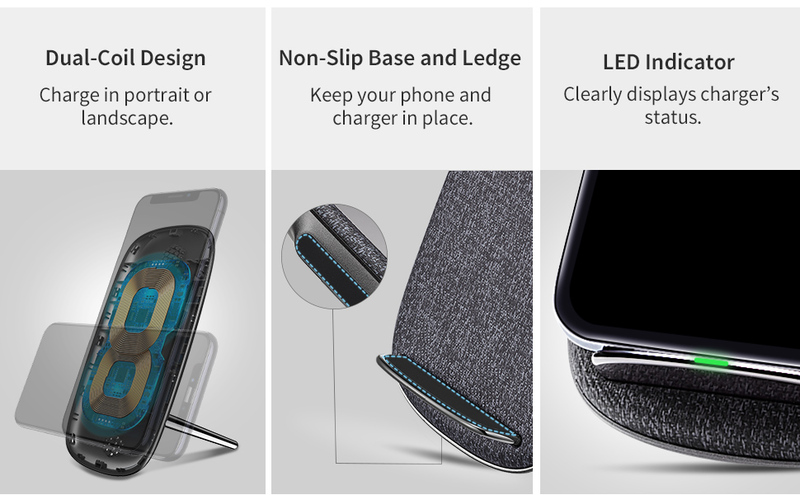 A unique base design and non-slip pads give added stability to keep your phone and charger in place. User-Friendly Design: Charging is convenient with 98% of phone cases able to be kept on while charging (excludes cases over 4mm thick and metal cases). A soft indicator light shows the charger’s status whether charging, in standby, or when a foreign object is detected. Advanced Safety Features: Built-in Overheating Protection and Short-Circuit Protection features keep your device safe. Foreign Object Recognition automatically detects if the phone is capable of wireless charging. 1. This wireless charger is not compatible with the iPhone 6/ 6s/7 or the Apple Watch. wireless charger, it is possible the power will be insufficient to charge your phone properly. 3. The charging stand’s legs have been designed for the perfect viewing angle and are not removable or adjustable to ensure long-term durability. 4. The indicator light has three display modes. The light is green during charging, and red during standby. A flashing red light indicates an error; typically a foreign metal object in the charging area that needs to be removed. 1. Why is the charger getting warm when charging? It is normal for the receiving coil or plate to get warm during the wireless charging process. We use a premium textured fabric to lessen this heat as well as a unique chimney vent design that helps dissipate heat quickly. 2. Why is my phone not charging when placed on the charging stand? First, please ensure your phone is Qi wireless-charging compatible. Second, please make sure the phone is aligned with the center of the charging stand. Please remove phone cases thicker than 4mm. For phones with a screen 5.5 inches or bigger, please place your phone horizontally for better charging speeds. If you have any question about compatibility or alignment, please let us know so we can help you. 3. Why is the charging speed slow? First, please make sure that the phone is properly aligned with the center of the charging stand. If your phone supports fast charging, it requires a QC 2.0 or QC 3.0 AC adapter (not included) for fast charge mode. Reducing the phone’s background applications may improve the charging speed. 4. Will it charge through a thick or rubber phone case? This ESR Wireless Charger is compatible with most phone cases. However, phone cases thicker than 4mm (like OtterBox) may affect wireless charging. Wir haben dieses Ladeger?t im Sommerhaus und laden hier ein Samsung S9 und Huawei P20 auf. Beide Telefone erkennen die Station sofort und laden sicher auf.Durch die Aufstellfunktion k?nnen wir das Telefon als Uhr verwenden.Das Telefon liegt sicher auf der Station und kann so leicht nicht herausfallen – alles ok.Man braucht zus?tzlich noch ein USB Ladeger?t. Really happy about this little piece of tech! I use wireless charging pretty much everywhere both at home and at work but all the other chargers I use are dead ugly. This one sits on my bedside table and not only it does look pretty but it does a pretty good job too. It’s not the fastest charger you’ll ever use but it manages to charge my note 9 in about 2 hours which is not too bad. Only CONS I have noticed is the led light which could be a little annoying for the more light sensitive ones over night as it is brighter than average. I will be buying another one to replace the ugly plasticky looking ones i have. Sehr sch?nes Teil wenn einen die LED nicht beim Schlafen st?rt.Funktioniert bei iPhone XSmax mit Otterbox Cover leider nicht. Ich liebe dieses Ladeger?t! Es ist stabil, sieht stilvoll aus und l?dt zu angemessenen Zeiten auf. Ich habe andere drahtlose Ladeger?te, die Sie ben?tigen, um sicherzustellen, dass das Telefon zentriert ist, damit es aufgeladen werden kann. Andernfalls stehen Sie morgens auf und stellen fest, dass es nicht die ganze Nacht aufgeladen ist. Sch?nes Ger?t um einfach und schnell das Handy zu laden. Sch?nes Design und gute Verarbeitung. I’m using this to charge my Samsung S8.Works well enough and it’s simple to use. The light that emits when charging is too bright for a bedroom so I keep this on my work desk instead.Charging times have been fine, similar to other wireless charging units I have.Build quality of the unit is OK and I’ve not had problems with positioning of the phone to make it charge etc. So all good there.Design-wise it’s quite contemporary looking compared with some of the other chargers I’ve had which have been quite plasticky. I love wireless charging, I love Phone stands and I love the colour/look of this.This is my 3rd wireless charger and by far the best. First of all the lie flat chargers I am not keen on because I prefer the stand for watching TV etc. My other one is a wood effect one which does not suit my rooms very well but tihis looks great.The other great thing about this charging stand is that it has an LED which indicates when charging is in progress. This is particularly relevant if you charge with your phone in landscape mode becuae it is easier to miss the ‘charging sweetspot’Great product. Highly recommend.